Grilling season doesn't end when there is snow on the ground! 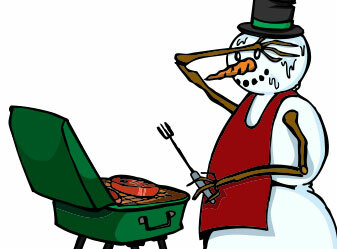 Here are our top ten tips for winter grilling! Invest in a grill cover if you don't already have one. This will keep snow and ice off of the barbecue and allow you to get grilling with the least amount of hassle. If you don't have a grill cover, you can buy one here. Wind chill isn't only for humans! Keeping your grill shielded from wind will help the barbecue heat up more quickly and help it to maintain the desired cooking temperature. NEVER bring your barbecue into the garage or other enclosure for cooking. This is a fire hazard, and there is also the risk of carbon monoxide poisoning. Carbon monoxide is a colorless, odorless, and tasteless by-product of burning fuel and can build up quickly in an enclosed area without your knowledge. Allow more time to preheat your grill than you would under more moderate conditions. The lower the outdoor temperature, the longer the grill will take to heat up. Preheat the grill at a higher setting than you normally would. Your gas grill will need to be set to a higher setting to reach the same cooking temperature under more moderate conditions. No peeking. Keep the top lid closed as much as possible. Every time the lid is opened heat escapes and the grill has to heat up again, which will ultimately increase cooking time. You're more likely to accidentally activate the Flow Limiting Device (a safety feature that limits the flow of gas in the event of a leak) in cold temperatures. Slowly open the gas tank no more than half a turn. Wait 30 seconds after opening the gas tank before opening the main control knob and lighting the grill. This will allow time for the gas pressure to equalize, thus reducing the likelihood of triggering the Flow Limiting Device. If you've accidentally activated the FLD, you might experience low heat and/or low flames. If you think you may have accidentally tripped the FLD, read how to reset it. Some electronic igniters do not perform well in cold weather. Keep a barbecue lighter handy just in case. If the control knobs are stiff or difficult to turn, do not force them because it is much easier to break off the knob or damage the valve stem in freezing temperatures. Light only the burners for which you can freely turn the control knobs and preheat the grill with a closed lid until the rest of the control knobs turn freely. If you can't turn any of the control knobs, position the grill away from the wind in a sunlit area to help them free up. Keep hot food hot! Keep carrying trays or plates for cooked food in the house (and ideally warm) until you are ready to take the food off the grill. Putting your grilled food on to an ice cold tray will only serve to rapidly cool your food. Now you are prepared for winter grilling.